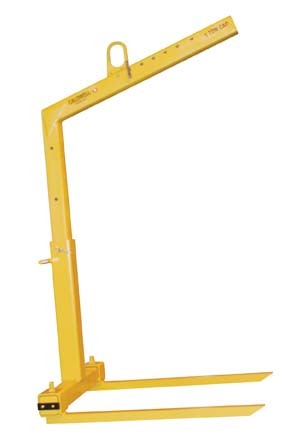 Construction Lifters adjustable Load Lifter is a crane attachment. Lifting bail adjusts to the correct center of gravity for handling different sized loads. Throat opening adjusts for different load heights. Tri-Adjustable model features adjustable fork spread. Auto-return bail hangs level when empty. Available in 1- and 2-ton capacities.